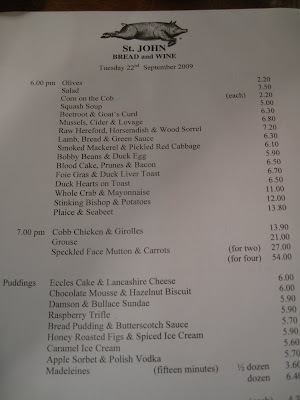 One of the last times I visited St John Bread & Wine I had a bowl of Quail Heads. That's not a typo. They weren't Quails or Quail Eggs or even Quail Legs, they were the heads of little Quails. There'd obviously been a little wager in the kitchen to see who would be dumb enough to pay for bin fodder. 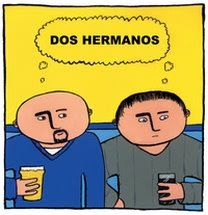 Hermano, take one step forward. What were they like ? Well, apart from the off-putting rictus grin of their little heads, they'd been roasted so that they had a satisfying crunch. My Vegetarian dining companion couldn’t bear to watch. StJB&W was a couple of minutes from where I worked so became a de facto canteen for me. When I changed jobs I couldn't visit for lunch and the evening crowds mitigated against a walk-in which is how I used the place. Even so I still used to pop in from time to time for their great Ice Cream or an Espresso and Vieille Prune. My original intention had been to try upstairs at John Torode's new place The Luxe which HS blogged about recently. The upstairs restaurant still wasn't open and downstairs had appeared to have morphed into a rather grim looking bar. Which is where StJB&W came to my rescue. It was fully booked for the evening - as I suspect it usually is - but I must have been wearing my pathetic face as the very kind FOH took pity on me and found me a table. 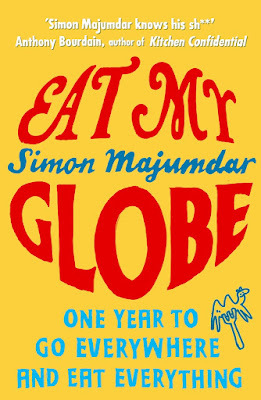 The St John style of food hasn't changed much, even going way back to a DH visit to Fergus Henderson's first gaff above the French House in Soho. One or two decent ingredients cooked simply and served sans any significant garnish is the MO and given the restaurants popularity there really isn’t any reason to change things. 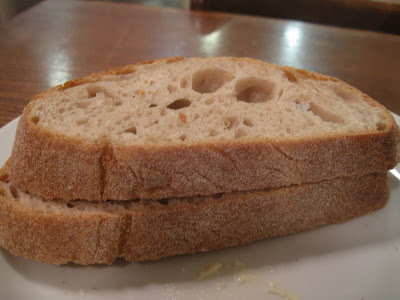 A meal always starts with a big pile of their great bread and before I realised it I’d scarfed down two pieces. The other two proved useful in mopping up the juices of my starter, a Blood Cake, which was an unctuous slab of Black Pudding. 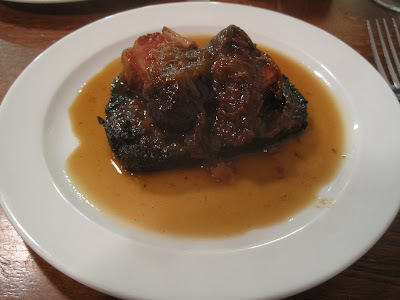 It was slathered with a bacon-studded compote of prunes. 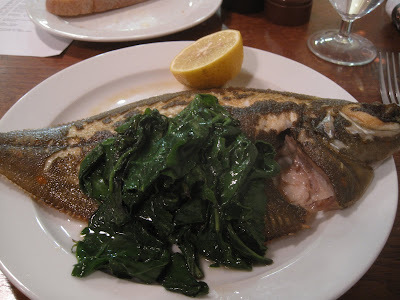 Unfortunately, the Grouse I had my eye on for my main course wasn’t ready but I enjoyed a whole Plaice. 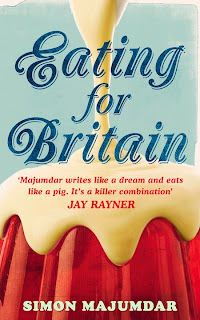 For me, the pleasure in eating all of a fish lie not so much in the flesh but in winkling out all the tasty gelatinous nuggets in the head in a similar way that demolishing a Chicken carcass is more satisfying than eating slices of breast. For me, puddings have always been the highlight of a StJ meal. 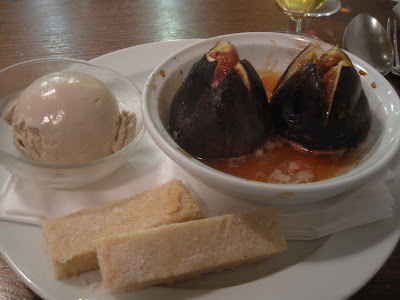 My Honey Roasted Figs, Spiced Ice Cream and Shortbread had echoes of a recent dessert at Seven Park Place. Not as refined maybe but just as enjoyable. 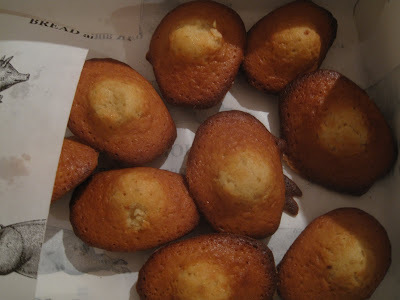 Tiredness precluded launching into the digestif list but I scored a dozen Madeleines to take away and very nice they were too with a cup of tea. I shall still pay The Luxe a visit when they finally open their restaurant but they’re going to have to be pretty good to compete with StJB&W. My guess is that they may well be relegated to the role of Plan B for people who can’t get in the place over the road. Let’s hope they’re not too disappointed. My family love to remind me of the time I ate 6 quail's heads in one sitting as part of a welcome meal when we were staying with friends near Agen. 2 quails a piece as a second course, with my parents declining to follow our hosts' examples and decapitate and eat the head in one mouthful. I tried one, enjoyed it, and ended eating another five. I may have to go back to StJB&W if they're going to be on the menu for long as I haven't eaten them for 20 years. This was about five years ago - I somehow doubt if they've had them on since. BTW are you saying that it's a proper dish ? No! The quails were small ones, roasted whole, head and all (I seem to remember the beaks had been removed), so it was just part of the dish - hence decapitation. I liked them - crunchy outside, creamy on the inside. 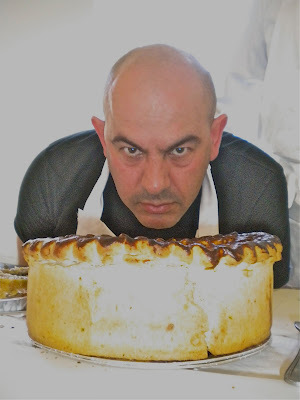 It's a real gourmand's anxiety this: is someone in the kitchen getting a rise out of us? My dad was once served 'cervelles de veau' in Paris and it came whole and with no sauce at all, and to this day he's unsure whether he was being laughed at as a 'touriste'. And in a world of acquired tastes and mixed cultures I think this will go on. Loved the chicken feet I ate at a dim sum restaurant lately but most people I know would accuse me of being gastro macho. A quick glimpse of things to come as HS moves to LA...HP goes to the most famous offal restaurant in the UK,and orders ...fish ...as a main course. 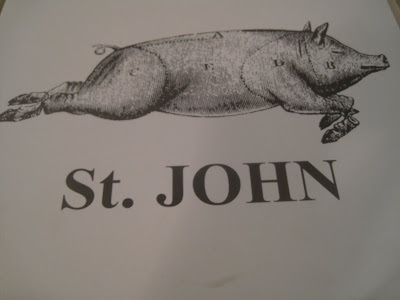 Had the roast suckling pig feast dinner at St John this Saturday just gone and as the host and birthday boy I was presented with the head. Me and a friend just sat their and ate everything - cheeks, ears, brains, eyeballs, tongue - it was all delicious. The eyeballs were especially nice - like eating an especially juicy piece of fatty pork. Would I right in thinking that Shoreditch is superior to Farringdon in your view? I always go to St John St as it's near work for me but looks like I'll have to get along to see for myself. Also, I visted Masters Superfish last night - via The Royal Oak - and all you said was true so many thanks!